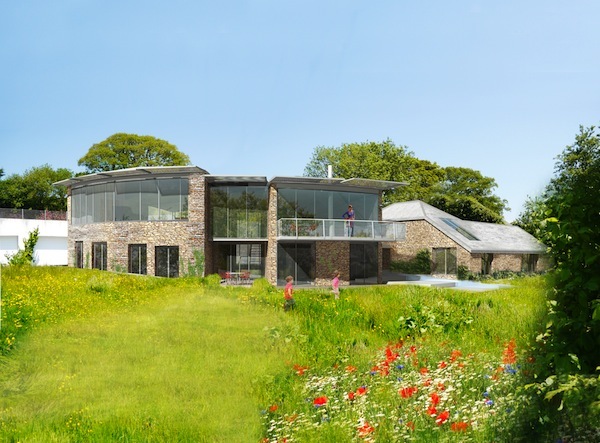 Work has begun on-site for a modern five-bedroom family home in picturesque West Devon. Located on an old farmyard overlooking Dartmoor National Park, the edgy home is designed to sit in harmony with the landscape and the surviving outhouses. The original granary will be completely refurbished to become part of the accommodation, accessed via a covered glass walkway from the main kitchen. Natural materials will be employed, with an emphasis on local stone to soften the modern form and create sympathy with the granary, and combine with extensive highly insulated glass that will allow generous natural lighting and fantastic views across the stunning countryside. An innovative Sustainable Drainage System will not only enable effective rainwater collection and harvesting, channeling the water down a stepped promenade under the walkway between the house and the granary, but also create a feature rainwater pond.